which aims to replace the one that is natively available on Windows operating systems. To attract users, he chooses to be able to display up to 2 windows and therefore to have two different directories. This view is very practical and allows you to move documents very easily. This alternative is therefore to be considered if you like to handle files quickly. 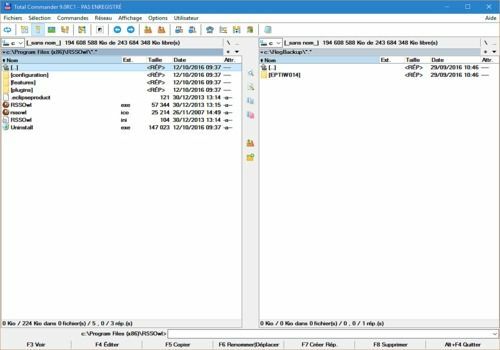 In addition, Total Commander allows you to search for duplicate files and supports the playback of many archives while the Windows Explorer only supports ZIP formats. It also features an integrated FRP client and allows you to control the speed of document transfer so as not to overload your computer. Total Commander can also be customized with plug-ins that add additional features. These plug-ins allow you to add compression formats, read resource data from.exe,.bbs...and many others. Almost a hundred plugins are available from the site of the publisher or third party publishers. This utility, formerly called "Windows Commander", was developed with Delphi and originated from other file managers such as "Norton Commander". Its first version dates from 1993, and it was only in 2002 that the final name, and under the impetus of Microsoft, replaced the old one. Once distributed on floppy disks, the software has now become multi-platform and above all continues to be updated by its creator, Christian Ghisler. A small jewel among software gems, Total Commander remains an absolute reference in terms of file management, to such an extent that some keep the old versions and media as sacred relics! Not to be confused with File Commander, the software that also bears the little name TotalCMD is unique, often copied, but never equalled. A mobile version exists for smartphones, but let's face it, it doesn't have the same flavor as its PC counterpart, which has evolved from Windows 95 to Windows 10, including Windows 8 and XP of course! You can use it to easily transfer contacts, photos, music, videos and other files between iPhone and Android. It allows you to back up Android files and data on your computer with a single click and restore all items on phones or Android tablets from the backup. FonePaw iOS Transfer is a software that allows you to simply transfer data (contacts, messages, photos, etc.) and files between iPhone / iPad / iPod, iTunes and PC / Mac. MuCommander is still relevant. This file manager has been updated and still allows you to replace the Windows file manager advantageously.